Air is an extremely compressible gas, and as a result, atmospheric pressure varies considerable with height. Western Disturbance is an extratropical storm originating in the Mediterranean region that brings sudden winter rain to the north-western parts of the Indian sub-continent. In this article we have discussed, the concept of western disturbance, from where it is originates and how it impact on the Indian sub-continent. Air is an extremely compressible gas, and as a result, atmospheric pressure varies considerable with height. This pressure is not equally distributed every part of the globe and also not always the same for any one region all the time. Atmospheric pressure is affected by altitude, temperature and by the Earth's rotation. Cyclones, hurricanes and typhoons are all the same weather phenomenon which transfer energies equal to several megaton nuclear bombs, from the ocean to the atmosphere every year. Nearly 70 to 90 cyclonic systems are develop all over the globe every year. The Coriolis force, the deflecting force caused by the rotation of the Earth about its own axis, is maximum at the poles and progressively decreases to zero at the equator. These forces compel the surface winds to spiral towards the low pressure system. The extratropical storm originating in the Mediterranean region that brings sudden winter rain to the north-western parts of the Indian sub-continent is called Western Disturbance. It is a non-monsoonal precipitation pattern driven by the westerlies. Extratropical storms are a global phenomenon with moisture usually carried in the upper atmosphere, unlike their tropical counterparts where the moisture is carried in the lower atmosphere. In the case of the Indian subcontinent, moisture is sometimes shed as rain when the storm system encounters the Himalayas. 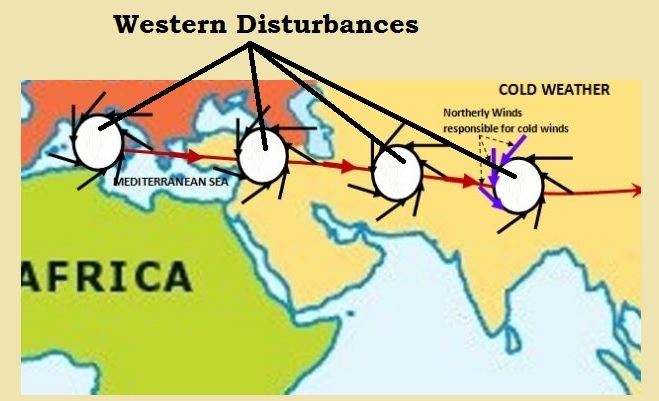 Western Disturbance originates in the Mediterranean Sea as extra-tropical cyclones. A high-pressure area over Ukraine and neighbourhood consolidates, causing the intrusion of cold air from Polar Regions towards an area of relatively warmer air with high moisture. This generates favourable conditions for cyclogenesis in the upper atmosphere, which promotes the formation of an eastward-moving extratropical depression. They gradually travel across the middle-east from Iran, Afghanistan and Pakistan to enter the Indian sub-continent. Western Disturbance plays important role in bringing moderate to heavy rain in low-lying areas and heavy snow to mountainous areas of the Indian Subcontinent especially in winter. This disturbance is usually associated with cloudy sky, higher night temperatures and unusual rain. This precipitation has great importance in agriculture, particularly for the Rabi crops. Wheat among them is one of the most important crops, which helps to meet India’s food security. Excessive precipitation due to this disturbance can cause crop damage, landslides, floods and avalanches. Over the Indo-Gangetic plains, it occasionally bring cold wave conditions and dense fog.These conditions remain stable until disturbed by another western disturbance. When western disturbances move across northwest India before the onset of monsoon, a temporary advancement of monsoon current appears over the region. Previous Story What is the Solar Nebula Theory?